Tryst is a Real-Time Strategy (RTS) game developed by BlueGiant Interactive. If you take a look at the gaming styles that are out for the PC today, there are a few genres that really stand out; MMOs, RPGs and Real-Time Strategies. This is where Tryst fits in and if what we’ve seen so far is anything to go by, it’s going to make a big splash indeed. Tryst is packing a lot of great features. One such feature is a single player campaign, which I first got a look at in the beta. The first mission I tried was one I have seen in many different Real-Time Strategy games. You find yourself controlling a small group of humans and you have to keep your commander alive as you make your way around the map completing different sub-missions. The second mission is a bit more Real-Time Strategy based. I had to build a barracks and make 5 soldiers. This was a great experience and I really got a sense of what BlueGiant Interactive are trying to do. The enemy I was fighting was called the Zali who are a mechanical race and are a great adversary and an interesting concept from a player point of view. One part of Tryst I really got interested in was the Augmented Research Mechanism or ARM for short, in its basic form this lets you modify your troops to give them perks on top of what they already have. It really is a great idea which gives you the ability to really customise your units and make some really interesting combos. However, I really don’t think the single player campaign is where the meat is going to be. And boy was I right. Multiplayer in Tryst is where you are going to spend most of your time, something the developers told us was their aim all along. This is where you can get games of upto 8 people playing in many different game types. Looking at what BlueGiant are trying to do you can really see Tryst doing the tournament circuit and with added features that have been said to be coming, such as ranking, clans, achievements and many more, the Multiplayer side of Tryst is where it’s going to advance. If a community rises now Tryst is released, then it could take the place of where Blizzard’s Starcraft is at the moment. Graphics in Tryst really look good as BlueGiant are using the Unigine engine, which will bring you state of the art graphics. While playing the preview build I was concerned that things looked a bit rough round the edges, but when they sent me the release version, I got to see the final build and BlueGiant really did finish off the polish and really nailed the game from a graphic point of view. Overall Tryst is a great game. I got to play it in an early beta and also in the final build, and I have to say it came on leaps and bounds. 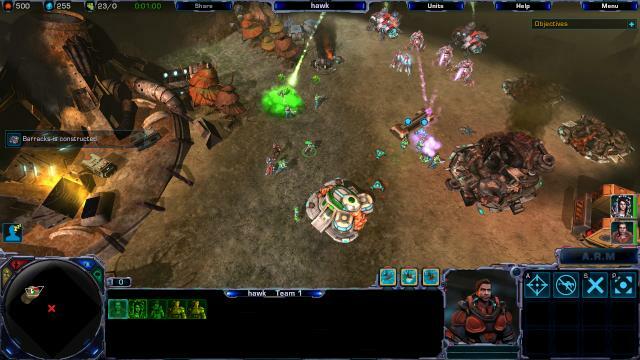 If you enjoy games like StarCraft and League Of Legends then this is very much a game you will enjoy. If you are buying this game, just beware that there really is not much building, it’s very much about a small build tree with a lot of emphasis on your units and keeping them coming out to fight. But it’s a cracking entry into the RTS genre, just as long as you’re happy to buy a game which has been created 95% for online play. Please contact us for details on how to send us biscuits or doughnuts.